Programs for Correctional Behavioral Health Services. For programs for Residential and Community Behavioral Health Services please click here. Improve the quality of your treatment and gain peace of mind that effective, readily documentable treatment will be taking place! Phoenix/New Freedom Programs offers a force-multiplier for correctional providers of behavioral health services. From workbooks to individual one-hour lessons to in-cell resources, we can provide a full range of programming to fit your specific needs and dosage. OPEN TO CHANGE. — This flexible, open group/open admissions program presents up to 6, 10-session modules. Each module presents a mini-journey through the stages of change, starting out with Pre-Contemplation resources and ending with Action Planning resources. Participants may enter the program at any point, with Pre-Contempltion resources just around the corner! Available in adult, juvenile, and female versions. Substance Abuse Aftercare — We have hundreds of hours of CBT-based, MI-infused workbooks that cover all aspects of transition and relapse prevention. Ideal to follow up on residential or intensive outpatient treatment, and provide seamless continuity of care. Comprehensive Symptoms Management Curriculum — Specifically designed for the most serious and persistent mental illness, this easy-to-implement new curriculum is based on Cognitive Behavioral Therapy (CBT), Motivational Interviewing (MI change model), social learning theory (skills modeling, practice, and mastery), and selected Dialectical Behavioral Therapy (DBT) skills. Based on a program at use at Riker’s Island Jails, this comprehensive, 50-hour program addresses a variety of common symptoms as well as specific overlays for Psychotic Spectrum and Mood Disorder symptoms. The program makes a clear connection between client changes (med compliance and new coping skills) and feeling better (symptom frequency, intensity, and duration). It includes critical overlays for self-injury and anger/aggression/violence, along with a comprehensive set of skills for interpersonal competence. An emphasis on Situational Confidence in facing high-risk situations addresses acting out behaviors, with specific tools including Situational Confidence Questionnaires. 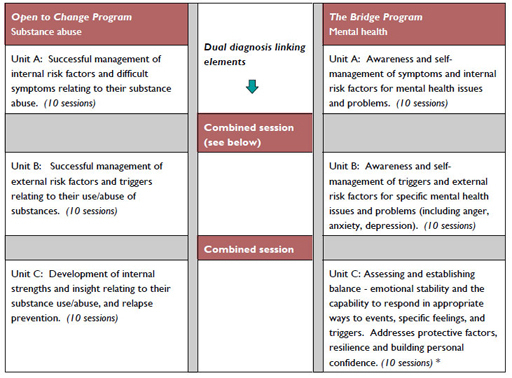 The Bridge —Designed initially to provide residentially-based cognitive behavioral therapy in mental observation units at Riker’s Island Jails in NYC, this flexible, modular program offers a solid, CBT-based approach for mentally ill participants, enhanced with selected Motivational Interviewing (MI) tools, DBT elements, and critical coping skills. A comprehensive self-management program for inmates in mental health units. Tailored to help them transition from segregated or in-cell placement to successful adjustment in less-restricted settings, it is shaped to address adjustment issues with cellmates, with others in the unit, and with staff, it specifically addresses interpersonal problems, self-management, fighting, bullying and victimization. It includes 52 sessions in a core program and an optional extended-stay model of 60 additional lessons for skills development and practice.